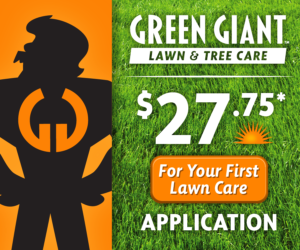 $27.75* Lawn Care Application Special! $27.75 price is for the first application only and applies to lawns up to 10,000 square feet. Taxes are paid by customer. First application includes weed control and fertilizer. Must purchase an annual lawn care package. New residential customers only. Must either prepay or pay via auto-pay. For lawns larger than 10,000 square feet, the discount on the 1st 10,000 square feet will apply. Must be within Green Giant’s service territory. Offer cannot be combined with any other offer/promotion/discount. Select from our Basic, Plus or Premier Lawn Care packages to receive this special offer. Click on any of the following links to find out more. Our Green Lawn Premier Program provides just about everything a lawn needs other than watering, mowing and repairing damage caused by others – whatever it takes. All of the following are included as needed. Broadleaf Weed Control, Season-Long Crabgrass Control, Nutsedge Control, Proper Fertilization, Aeration, Aeration with Overseeding, Preventative Grub Control, Disease Control, Lime or Sulfur, Unlimited Services Calls, and 3 Quality Assurance visits per year. Our Green Lawn Plus program is our most popular program and will provide the most common things that a lawn needs including: Season-Long Broadleaf Weed Control, Season-Long Crabgrass Control, Proper Fertilization, Fall Aeration, and Preventative Grub Control. Our Green Lawn Basic program provides what is needed to grow a very nice lawn. However, it does not provide protection against turf damaging insects such as grubs or other services that can protect and/or enhance your lawn. The following services are included: Broadleaf Weed Control, Season-Long Crabgrass Control, and Proper Fertilization. Click here to view more information about our Lawn Care Packages. $47.75 price includes an initial inspection, treatment as needed for any covered pests (see below) and free service calls to control covered pests for three months. New residential customers only. 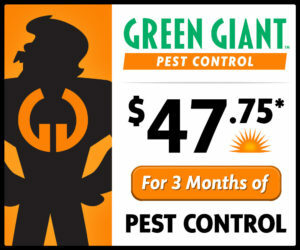 Must purchase Green Giant’s Year-Round Pest Control Program. Taxes are paid by customer. Must either prepay or pay via auto-pay. Heavy infestations and/or multiple infestations may incur additional cost. (We will not perform any work that incurs additional cost without customer’s approval). Must be within Green Giant’s service territory. *Stinging insect nests more than 15 feet off of the ground will incur additional cost. $47.75 price includes an initial inspection and treatment of your ant infestation and our guarantee*. Includes nuisance infestations of carpenter ants. Heavy carpenter ant infestations will incur additional cost. (We will not perform any work that incurs additional cost without customer’s approval). Residential customers only. Must purchase Green Giant’s Year-Round Pest Control Program. Taxes are paid by customer. Must be within Green Giant’s service territory. Must either prepay or pay via auto-pay. *Guarantee includes unlimited, free service calls to control the infestation. Whether you’re looking to control weeds, build the thickness and density of your lawn or protect it from being damaged by insects & disease, Green Giant has the right lawn care program for you. Healthy landscapes are an important part of making your home or business beautiful and adds curb appeal. Green Giant knows what your trees and shrubs need to thrive. Protect your trees and decrease populations of the Spotted Lanternfly with Green Giant’s Spotted Lanternfly treatments. Remove unwanted vegetation from your home or business with our worry-free treatments. Pathways, fence lines, parking areas, garden beds and more… See how Green Giant can offer to make your landscape hassle free. Green Giant knows how to get rid of weeds. Our experience at the regions largest companies has given us the expertise to maintain your beautiful investment from small business to large industry. 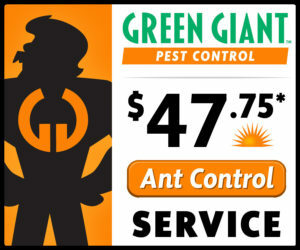 Green Giants licensed technicians offer leading edge pest control services and protection plans for homes and businesses within Southern Pennsylvania. Need help choosing the right Green Giant package?